Multiline II is a 3-strand composite rope, made of filament polyester and fibrillated polyolefin, that has been used in Challenge courses and High Ropes courses for more than 30 years. It provides the greatest durability, lightest weight and most consistent supple feel over time of any available composite rope. Multiline II is a 3-strand composite rope, constructed by twisting three strands made of a blend of spun and filament polyester, around cores of fibrillated polyolefin. The polyolefin keeps the strands firm and round without adding weight, which improves abrasion resistance and handling. The spun polyester gives Multiline II its characteristic fuzzy feel and makes it easier to grip, even when wet. Multiline II has been the rope of choice in Challenge courses and High Ropes courses for more then 30 years. It offers the greater durability, higher strength and lighter weight than any commercially available composite rope. In addition, the spun polyester caters for consistent supple feel over time. Multiline II is easily identified by its familiar two orange markers. 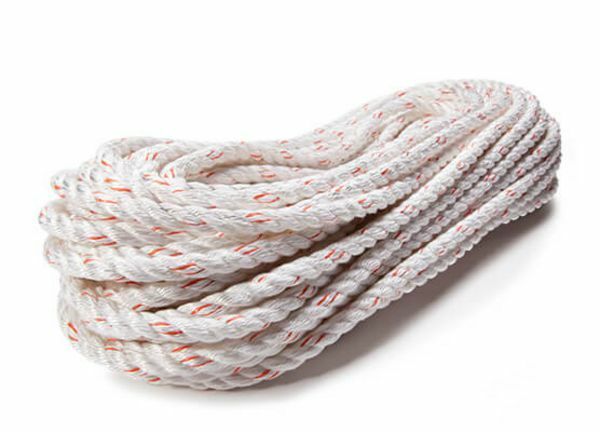 The 3-strand construction makes this rope perfect for splicing, which retain a lot more strength than the use of knots. This rope is a standard for use as lobster claws, lanyards or any other situation where spliced eyes are required or preferred over knots. This allows the end user better strength and the ability to make custom length units. Perfect for lanyards and lobster claws. 7/16” and larger Multiline II is approved by TEUFELBERGER Fiber Rope Corporation for use in the challenge course industry as a low stretch rope for belaying a single participant when top-roping and/or as part of an ACCT compliant lanyard/tether. Made in the USA! Multiline II is proudly made by expert crafts men and women in our US facility located in Fall River, Massachusetts.